Administrative unit (prefecture) in the Chūbu region on the main island of Honshu ( Japan ). There is also a city called Yamanashi about 100 kilometers west of Tokyo, literally meaning mountain pear. The seat of the prefecture administration is the city Kōfu. According to legend, in the year 718, in the city of Katsunuma, the holy Gyoki planted him by the Buddha Nyorai vines and built the Daizenji Temple. In honor of the Buddha, Gyoki created a statue still standing in the temple called Budo Yakushi (Budo = Wine, Yakushi = Teacher of Medicine, wine was long regarded as a medicinal medicine in Japan). In the Meiji era (1868-1912), Japan began to open up to Western ideas and techniques. In 1877, the Dainihon Yamanashi Wine Company, the precursor of today's Mercian Katsunuma Winery, founded. One year later, Masanari Takano (1852-1923) and Ryuken Tsuchiya (1858-1940) became new members France sent to get there knowledge about viniculture and winemaking to acquire. They took their job very seriously, were throughout the process of pruning over vintage to the basement works and made many sketches. After two years, they came back and their knowledge was the basis for the now beginning production. 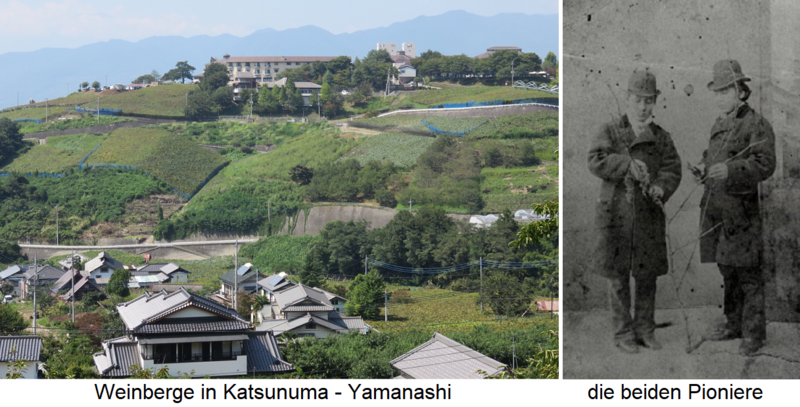 This was not very successful due to lack of quality and finally Dainihon Yamanashi was dissolved in 1886 again. Nevertheless, that was the beginning of Japanese viticulture. This page was last modified at 17 September 2018 at 18:24.